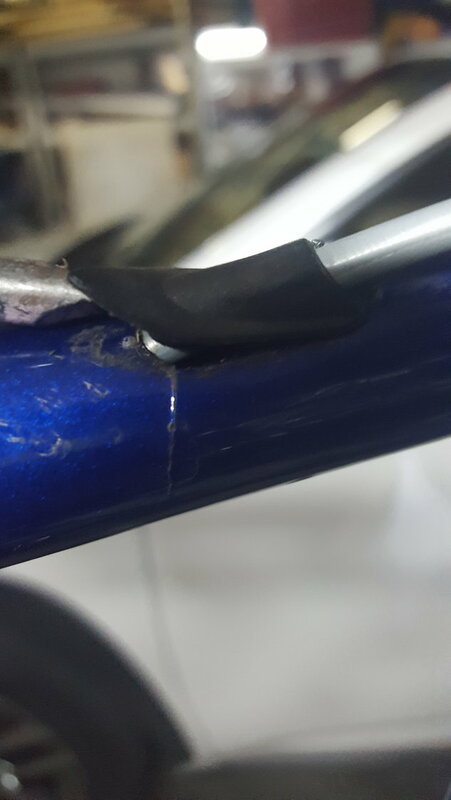 I am thinking the only fix would be a top tube replacement (have a shop that builds close, Silva Cycles, and will get an estimate) but probably between fix, paint and everything thinking I will look for a new frame. Ideally a sleeve inserted internally and brazed up should hold it, however I wonder if a wrap on the outside will give the same result in durability with a lot less work. Internal sleeves is how i fixed my personal bike/frame that came off my roof rack going down the highway and badly dented the top tube. I made the sleeves on my lathe (each end had a different ø requirement) and brazed them in one at a time. This method worked great and I am surprised it isn't more commonly done (especially on brass brazed and pinned classic frames). 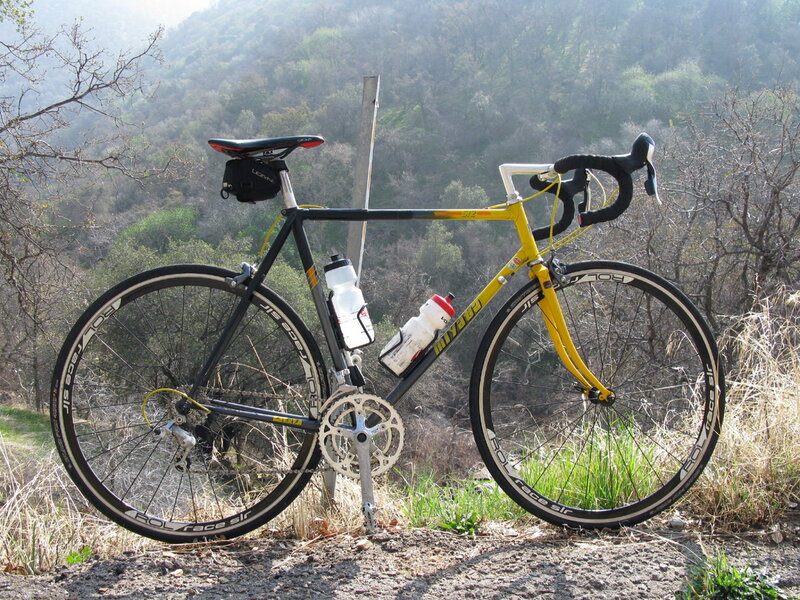 I choose not to replace the through the top tube brake cable routing. I had a Hellenic seat stay attachment where the seat stays pass the seat tube and attach under the top tube so there was no way to just replace the entire tube tube. How do you access the inside of the top tube? Is it open enough through the head tube? There is another topic about the same bike with some suggestions of an external band. And, the OP has said he is planning on scrapping the frame rather than repairing. Oh... in the other topic, there are notes about internally splined tubing. That might foil plans to shove reinforcement inside. Is the hole in the butted area? Those Miyata's broke all the time it is a simple repair. The main thing is that the repairer should cut out the old tube and then mechanically remove the old tube from the lug, not burn it out since that will further weaken the steel tubes that are not being replaced. Putting a stainless steel guide tube is best if you are trying to keep the same concept going, but a couple of cable stops silver brazed on is hands down the strongest. The amounts quoted by my shop f(not cheap, but good quality work, I have worked with same mechanic for 10 years or so), for either top tube replacement, or a colnago mixte type repair are high enough that I am looking for a new frame (am very close on one). So I am using this as a N-1, N+1 zero sum opportunity to get replacement frame that is going to be a step up. There are several huge advantages to splicing in a new piece of top tube rather than trying to replace the whole tube. 1st there is no heating involved in removing the damaged tube. And it is much easier to clean and prep for brazing. It does take a bit of care to get the ends square and some thought and investigation where the butting starts and ends. 2nd there is no mitering necessary although the 4 ends have to be cut to an exact length and be 90º square. 3rd getting out an old tube without damaging the lugs (especially if it has been pinned and brass brazed) and getting rid of any left over brazing material can be a real effort and not always successful. Cleaning up the end of a cut off tube is way easier by comparison. Of course one has to have a lathe and thicker walled tubing to be the splices that can then be shaved down to within a thousandth of an inch to exactly fit each of the four sockets. I brazed one splice to the new middle of the top tube and the other splice to one of the ends of the frame tube. There is enough spring in the frame to allow the new tube to fit into the frame. Since I’ve been making frames professionally longer than many posters have been alive it was not a difficult braze for me to finish the other ends of the splices. Someone not as sure of how much silver should be added or have as great heat control could preplace a ring of silver inside instead and sweat it out. I suppose it took me somewhere between 2 and 4 hours to complete the entire task not including painting. I made my frame out of 7/4/7 heat treated tubing so something heavier would be easier to do. After primer it looks indistinguishable from an undamaged frame. Over many years I’ve repaired (including alignment) and repainted hundreds of frames (or more I haven’t counted). The Japanese made frames were some of the very best. Unlike some of the classic European builders (many who I have personally visited back in the 70’s) that were a bit sloppy and crude in their methods, the Japanese knew how to make an aligned steel frame. Meanwhile, my repaired 512 Competition laughs heartily at this thread. while enjoying a fine morning in the local hills.